Edward R. Murrow’s Gospel chorus class performed with the Brooklyn College Conservatory Singers and Symphonic Choir on December 6th. This is the second time that the Gospel chorus sang at the school and as the upcoming holiday season approached the chorus was invited to sing two Handel Messiah songs with the chorus. The Gospel chorus performed as part of the Young People’s Concert Series and wanted to develop connections and partnerships with local high schools. The chorus is conducted by Dr. Malcolm J. Merriweather, the Assistant Professor and Coordinator of Vocal Studies at Brooklyn College. 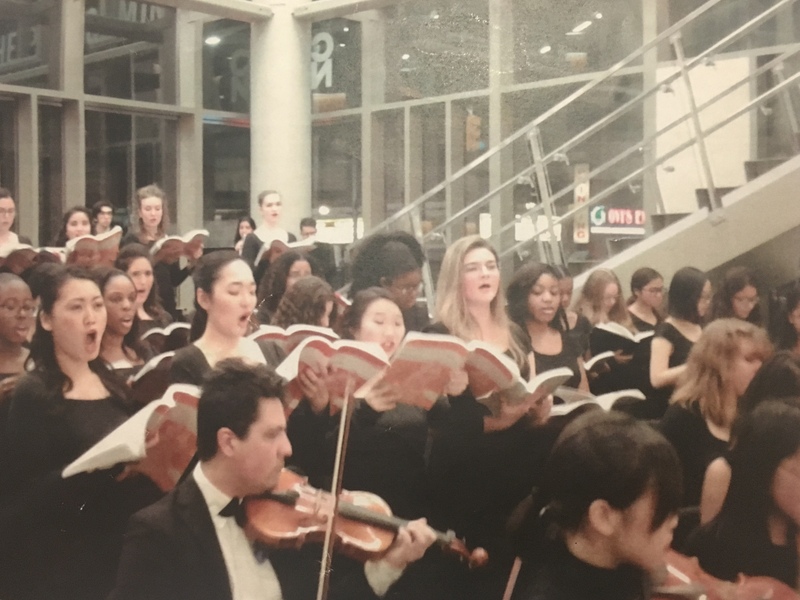 The performance was held in the Don Buchwald Theatre at Leonard & Claire Tow Center for the Performing Arts Atrium, which is located the school’s campus. The Brooklyn College Choir covered 32 songs from Handel’s Messiah such as, And He Shall Purify, For Unto Us A Child Is Born and Behold The Lamb Of God and the school’s Gospel chorus class accompanied them for And Of Glory Of The Lord and The Hallelujah Chorus. Junior Michele Mondesir said that she hoped the audience came away with a positive appreciation to music after hearing their performances. “It was a long show but I felt that they should’ve had emotional affection to the way that we sang. It should’ve hit their hearts,” said Mondesir. Ms. Johnson said she is looking forward to next year’s show.